The Parachute! It's the most requested activity each year at the Senior Breakfast. Announcements! Gabe Garcia and Katie Glenn make a guest appearance on the morning video announcements. Final Walk-through! Graduating seniors who attended RJE take one last walk around the school. Final Walk-through! RJE's current student body line the halls to give the graduating seniors a proper send off. The Parachute! The seniors hide under the parachute. The Parachute! P.E. Coach Lisa Stout calls out instructions as students run to escape from the parachute. The Parachute! The seniors watch the parachute slowly drift back to the gym floor one last time. Dancing in P.E.! It's been seven years since the seniors last did these dances, but they still know all the moves. Dance Off! The seniors take on the third-graders at RJE. "Once a Jaguar, always a Jaguar!" McKinney, Texas – “Time flies,” mused McKinney Boyd High School senior Braylon Cyrus, with a shake of his head as he rested his arms against the top of a bookshelf in the library at Reuben Johnson Elementary. “It’s a lot smaller than what I remember,” he said with a smile, gazing across rows of shelves and toward the group of 30 or so high school seniors chatting at tables or mingling in small clusters at the other end of the room. Sprinkled among them were current RJE teachers and administrators as well as former staff who had returned for the occasion. There were hugs—and a few happy tears—as teachers reunited with students who were decidedly taller than when they last crossed paths. Seniors at the Reuben Johnson Elementary Senior Breakfast look for their photos in the pages of the school’s yearbook from their year in kindergarten. It was the annual Senior Breakfast, a tradition that RJE adopted from Wolford Elementary about five years ago and one that was celebrated by 17 other elementary campuses across McKinney ISD on Friday, May 25. 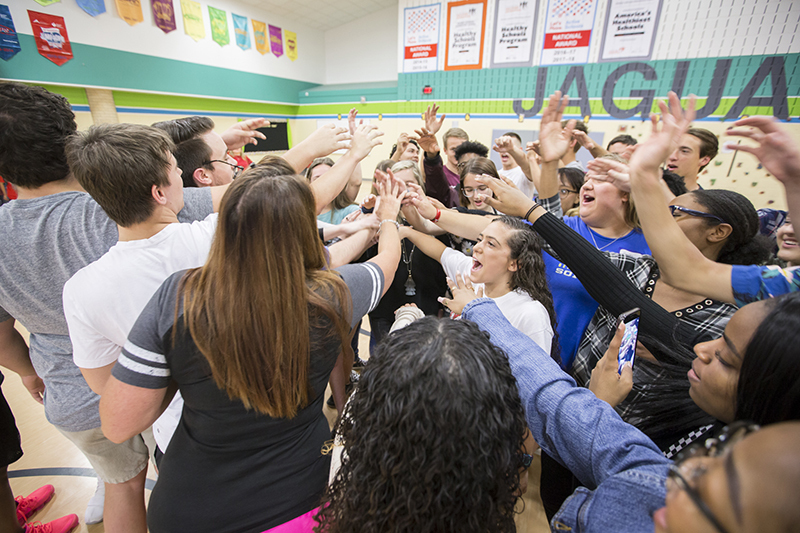 The graduating seniors/former RJE students who responded to the breakfast invitation drove over mostly from McKinney High School to visit one more time the school where their academic careers began—to revisit the place where it all started before embarking on the next leg of their journey. 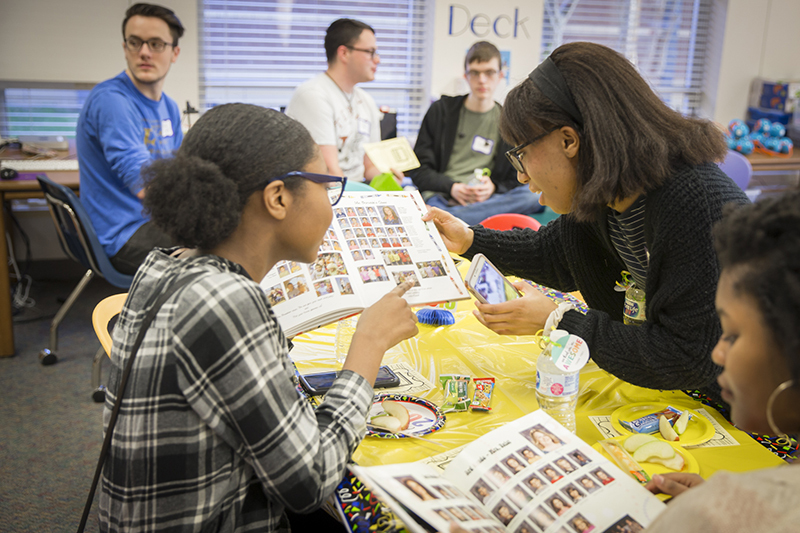 Seniors thumbed through yearbooks as they shared breakfast in the library, spinning the books around for others to see, pointing out photos from their elementary years. “Don’t take a picture of that!” said one senior with a laugh as she covered up her kindergarten yearbook photo. MISD Assistant Superintendent of Elementary Student Services Suzy Woodard returned to the campus where she had served as principal for eight years and circulated through the room greeting seniors whom she hadn’t seen since they were fifth-graders. 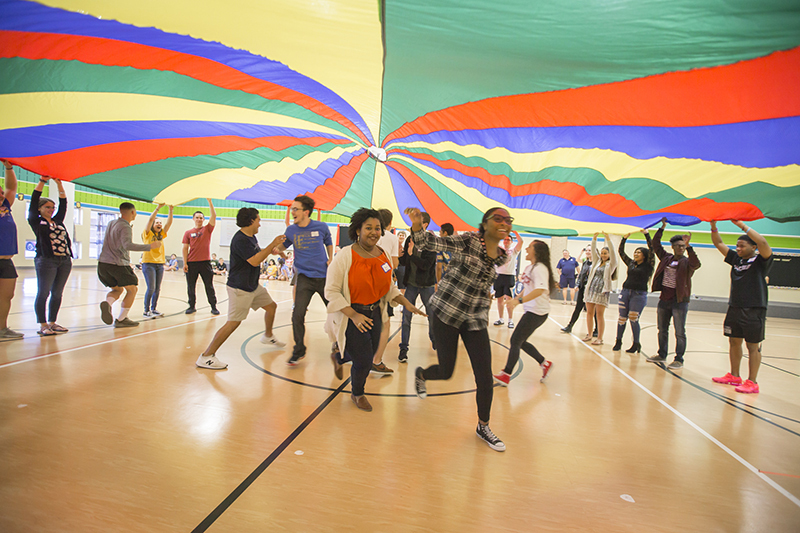 The parachute is the most popular—and most requested—activity at the Reuben Johnson Senior Breakfast each year. Current RJE Principal Michelle Baumann was there, of course, and P.E. Coach Lisa Stout—the one teacher that all of the reunited RJE alumni had in common from their time at the school. After breakfast, Stout led the seniors to the main stairwell for a group picture and then to the gym where they waited while MHS seniors Gabe Garcia and Katie Glenn headed to the broadcast room to to make a guest appearance on the morning video announcements. Gabe, an alumnus of the RJE morning announcement crew, found the now-Lilliputian scale of his former school amusing. “It’s just super weird because I’m like 6’ 2” now, and these kids are about [one-third] my size. I’m like a giant, but it’s fine. It’s cute,” he said with a laugh. After announcements, the current RJE student body poured out of their rooms and lined the halls as Lexi Vera from MHS led her fellow seniors on one more walk through the school in a parade celebrated with ear-piercing cheers and a seemingly endless chain of high fives. 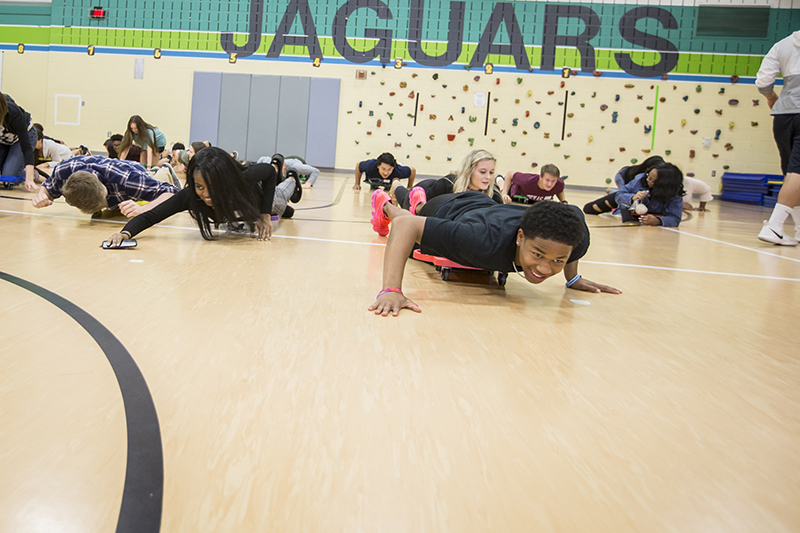 Boyd senior Braylon Cyrus revisits his childhood on the P.E. scooters at Reuben Johnson Elementary during the annual Senior Breakfast. Back in the gym, Stout brought out the highly-anticipated parachute and called out instructions as members of the 2018 graduating class were transported back to fifth grade P.E., lofting the chute into the air, running underneath it and back to their places, ducking inside and pulling it tightly around them and then finally stepping out and releasing the chute as they watched it sink slowly back to the gym floor with poignant finality. Immediately Stout ordered them to the scooters, and they were soon zipping across the gym on their bellies riding four-wheeled squares of plastic. Stout formed them into loose lines, turned up the P.A., and they revisited the choreographed wackiness of their old P.E. dance songs. They squared off at half-court for a dance contest with the third grade P.E. class. They sang the old RJE school song. And, it was all just…fun. A chance to be a kid again for a few minutes before they officially enter the world of adulthood. 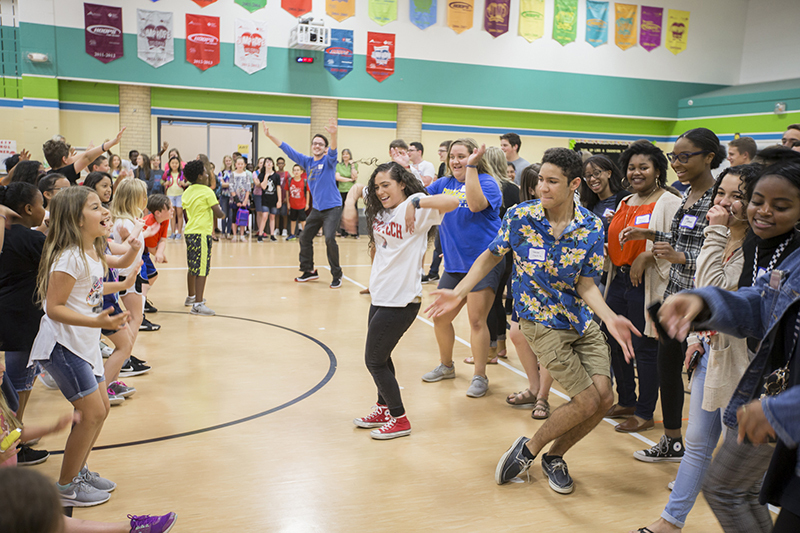 Graduating seniors who were once students at Reuben Johnson Elementary take part in a dance off with the school’s current third-graders during the school’s annual Senior Breakfast. The music ended, and Stout called them to her in the center of the gym, all hands in. She gazed at the familiar faces surrounding her—now at eye level—one more time. “Remember, once a Jaguar, always a Jaguar!” she told them with a catch in her voice. And, with a final, heartfelt shout of, “Jaguars!” the RJE 2018 Senior Breakfast concluded. For Stout, the event is always an emotional experience. Lexi Vera walked toward the RJE gym doors for what was likely the final time as an MISD student. “It’s a really cool experience to come back right before I leave for college. It’s like a big reminder of what my childhood was,” she said with a smile. And, the thing about a good start is that it doesn’t stay at the start. And, at some point along the way, it will probably carry you.